The Great Pyramid At Giza (7 Wonders) - For thousands of years, ancient Egypt was ruled by kings called pharaohs. For much of that time, Egypt was a rich and powerful nation. It held influence throughout the middle east and central Africa. As rulers of this wealthy and, the pharaohs lived very well. They had beautiful places and treasures of gold and jewels. They also built enormous royal tombs. The most impressive of these is the great pyramid at giza. As soon as a pharaoh became king, he ordered workers to build his tomb. No matter how young a pharaoh was, he had to begin planning where his body would be buried after death. The pharaoh did not expect to die soon. But Egyptian tombs often took a long time to build. Many workers and materials were needed, and each pharaoh wanted his tomb to be perfect. Some tombs were large complexes dug beneath Egypt's desert sands. Others were pyramids-enormous monuments several stories tall. The Great Pyramid at Giza is the largest pyramid ever built in Egypt. The history of Egypt’s pharaohs is divided into dynasties. A dynasty is a family of rulers. Ancient Egypt had thirty-two dynasties of pharaohs. They ruled the land from about 2920 to 332 B.C. Pharaohs in the earliest dynasties were buried in underground tombs. Workers covered the tops of the tombs with mounds of earth. Later, they began covering the tombs with rectangular buildings called mastabas. Mastabas has flat roofs and sloping walls. Builders experimented with the sloping structures, making them larger and taller. Over time, they created pyramids-four-sided structures that come to a point at the top. 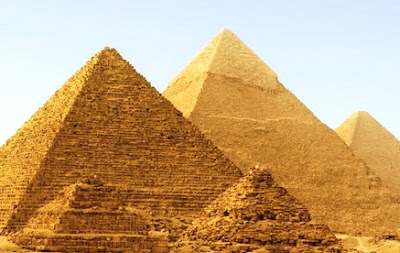 Egyptologists (people who study ancient Egypt) do not think that builders used the pyramid shape by accident. They believe that the shape had special meaning. Some Egyptologists think that the pyramids were built to look like a sacred stone called the benben. In Egyptian myth, the benben was a hill the first land to appear at the beginning of time. The sacred stone also represents the rays of the sun. Egyptians believed that pharaohs used sunrays to climb to heaven after death. About 2551 B.C., the Egyptian pharaoh Khufu came to power. Khufu is also known by his Greek name, Cheops. He was the son of King Sneferu and Queen Hetepheres. So after he became pharaoh, Khufu ordered his workers to begin building his pyramid. He chose to bulid at Giza, an area on the western side of the Nile River in northern Egypt. Giza was near the ancient Egyptian capital, Memphis. Present-day Giza is just outside the suburbs of Cairo, Egypt’s modern capital. Khufu was powerful enough to create a huge army of workers to build a special pyramid. For a long time, historians thought the Great Pyramid had been built by slaves. But modern Egyptologists think that Khufu's workers were paid volunteers. They believe that the workers were proud to take part in building the pharaoh's tomb. The workers came from all over Egypt. Many were farmers. They worked on the pyramid during the seasons when they did not need to tend their crops. Khufu paid the workers and bought their food and water. The building of Khufu's pyramid began with his architects-people who design buildings. The architects first planned the base of the structure. The sides of the pyramid face exactly north, south, east, and west. After the architects had marked the base of the pyramid in the sand, workers began bringing in the building materials. Each side of the Great Pyramid's base is almost 758 feet (231 meters) long. The base would cover ten modern football fields. The builders needed many, many stone building blocks to create a structure that large. Some of the limestone (a white or grayish rock) came from nearby quarries (places where stone is dug or cut from the ground). But some of the granite quarries were far to the south of Giza. Most of the blocks used to build Khufu's pyramid weigh about 2.5 tons (2.3 metric tons) each. Some of them weigh 70 tons (64 metric tons). That is almost twice the weight of a modern eighteen-wheel truck. How did Khufu's workers get these enormous stones to the building site? Egyptologists believe that the stone blocks from farther away were shipped down the Nile on boats. When the blocks arrived at Giza, workers loaded them onto sledges. Sledges are strong, heavy wooden sleds. Instead of wheels, they have runners (metal or wooden rails) along the bottom. The sledges also carried the stone from the nearby quarries. Archaeologists (scientists who study the buildings, tools, and other artifacts of ancient civilizations) are not sure exactly how the sledges were used. Workers may have pulled the sledges over a road made from wooden boards. Another idea is that the sledges were rolled over poles laid down on the ground. These poles looked like modern telephone poles. A little oil on the boards or poles would have made the pulling easier. After the first blocks arrived at the pyramid site, workers built the base. Then they added the second layer of stone blocks. As the building walls rose, workers had to lift the huge stones higher and higher. Archaeologists have several ideas about how builders lifted the blocks. One main idea is that workers built dirt ramps along the sides of the pyramid. Workers rolled blocks up the ramp and into position on the pyramid wall. When they were ready to begin the next layer, workers added more dirt to the ramp to make it higher. After the pyramid was finished, workers removed the dirt ramp with shovels. Other archaeologists, however, say that it would have been too difficult to build and use these ramps. After the pyramid walls were finished, workers covered them in white, polished limestone. At the tip of the pyramid, they placed a special block. That block was covered in gold or in a mix of gold and silver. Khufu's tomb was an amazing sight-standing 481 feet (147 m) high and gleaming white above the brown sands. It took workers more than twenty years to finish the Great Pyramid. The pyramid's 2.3 million stone blocks weighed more than 6 million tons (5.4 metric tons). Khufu's workers did a very good job fitting those blocks together. They still fit so tightly that a modern visitor cannot slip a knife blade into the joints between most of the blocks. But the pyramid was not the only building Khufu built at Giza. Nearby the built three small pyramids for his wives. He also built two temples-one for his funeral and one where people could worship him after his death. To the south, he built mastabas and other tombs for important people in his kingdom. After Khufu died, his son Khafre became pharaoh. Khafre had his own pyramid built just southwest of the Great Pyramid. Khafre's pyramid is not as large as his father's. But Khafre added his own monument to the site. In front of his pyramid sits the Great Sphinx-a huge stone lion with a human head. When Khafre's son Menkaura became pharaoh, he also built a pyramid near his father's tomb. The pyramids of all three pharaohs and their wives still stand at Giza. The Great Pyramid was the tallest building in the world for almost 4,900 years. Even in ancient times, it drew tourists awed by its size and beauty. Herodotus visited Giza in about 450 B.C. He listened to local stories about how the pyramid had been built and how many workers it had taken to build. Herodotus was so impressed by the stories that he included Khufu and the pyramid in his book The Histories. Modern Egyptologists think that some of what Herodotus wrote about Giza is incorrect. For example, he said that Khufu think some of Herodotus's details of the pyramid's construction are wrong. Still, Herodotus's book made Giza famous in ancient Greece. When a list of the Seven Wonders of the World was created, ancient historians included the Great Pyramid. Even in our age of skyscrapers, the Great Pyramid is still an amazing sight. Over the centuries, the Great Pyramid has lost most of its white limestone covering. But it towers over the desert floor along with the other ancient buildings at Giza. Thousands of tourists from all over the world visit the Great Pyramid each year. It is the only one of the original Seven Wonders of the World that still exists. Tourism and time have taken a toll on the buildings at Giza. The body heat and breath of visitors touring the inside of the Great Pyramid has raised the humidity (the amount of water in the air). The high humidity was beginning to damage the walls. Egyptian authorities did not want to keep visitors away. But they had to begin limiting the number allowed inside the pyramid. They also installed machines to control humidity. Egyptologists continue to study the Great Pyramid. They have mapped out and explored the burial chambers inside the pyramid. They have also mapped the whole complex at Giza and uncovered some buried buildings. But one thing they have not found is the body of Khufu. Because of their religious beliefs, ancient Egyptians preserved dead bodies to keep them from rotting after death. Ancient Egyptians believed that a person, especially a pharaoh, needed his body for life in the afterworld. So most pharaohs were made into mummies-preserved bodies wrapped in linens and placed in decorated coffins. In the afterworld, the pharaoh also needed his jewels, money, food, and other items. All the pharaoh's treasures were placed in the tomb with the mummy.